I got to use it under hazy/humid conditions last night, and also gave a bunch of students from my college astronomy club their first night vision experience. I only had the PVS-7 itself, a 6nm H-alpha filter, and a C-mount nosepiece for the PVS-7A/C (along with a C-mount-to-1.25" adapter). This very minimal setup still delivered stunning views, under moderately light polluted skies. We used it both at 1x and at prime focus inside an Orion 10" f/5 (f=1200mm) dob. It's always a pleasure to see people experience Night Vision astronomy for the first time. Many of them were experienced amateur astronomers and were really thrilled to be able to see the North America, the California, and other famous nebula all just hanging out in the sky. Unfortunately, the 6nm filter meant that there was pretty aggressive filtering, so there was quite a bit of scintillation. If I had my 10nm I think that would have been perfect. Swan Nebula was low on the horizon and awash in skyglow, but the 6nm filter pulled it out very distinctly. It lacked some detail that I'm used to in my C11, but I think the scope needed to be collimated, and the light pollution was pretty terrible. Resolution seems to be very sharp. M13, unfiltered in the dob, was quite a stunner even with the collimation issues. Veil, Dumbbell were both very lovely and caused gasps of disbelief all around. North America didn't really fit within the frame at prime focus, and I didn't have my focal reducer with me. Crescent Nebula was not very sharp or distinct, but its general structure was easily seen. Heart and Soul nebula were too large to fit within the field of view, but were readily apparent. Lack of manual gain definitely meant we were dealing with full levels of scintillation. I had forgotten how much I use that gain knob on my Mod3. Bi-ocular viewing was definitely nice. Even with the scintillation, having both eyes open definitely adds. I think that this means that I'm going to use it for lower power, less-aggressively filtered situations. This is also where having two eyes open adds the most to the "experience", I think, because it provides an even greater sense of "immersion" under a dome filled with stars. I initially found that getting my eyes "aligned" with the view through the eyepieces of the A/C was more cumbersome than with my B/D unit. I still find this to be the case. However, throughout the night of viewing, I got somewhat more accustomed to it and it wasn't as big of a problem as I had initially feared. 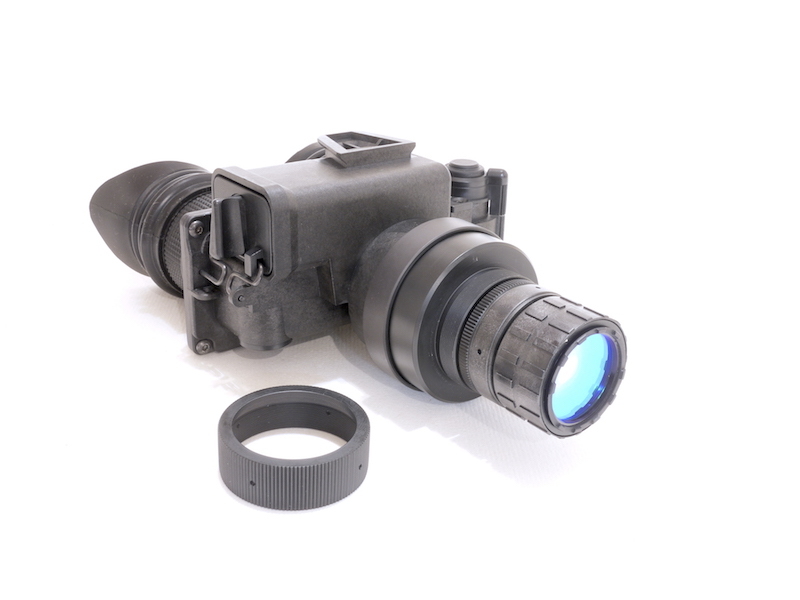 That being said, if I am going to use this PVS-7 more at low power and as a low-power complement to my Mod3, that also means that I will be hand-holding it more, and thus the ergonomics of how easy/hard it is to see through it will matter more. So, I'm still thinking that I will probably try to swap it for a B/D body. One significant downside of the A/C body is that swapping out the front nosepiece is much more cumbersome than the PVS-7B/D. Unfortunately, I've found that the PVS-7A/C nosepiece adapter for C-mount has somewhat recessed threads, so my ENVIS lens doesn't seem to fit, nor do any of my SLR lens C-mount adapters. At least the 1.25" Scopestuff C-mount adapter fits. I'm not sure that the 2" would... Yet another reason to get the B/D body. How do you think the clarity and sharpness compared to the Mod 3? I guess I have always wondered if the optics of the PVS-7 were as serious a limit as the tubes in them. Comparing a PVS-7 with an L3 filmless tube to a Mod 3 with an L3 filmless tube I think is the only way to really know how much the complex optics of the PVS-7 costs in terms of sharpness, clarity, and contrast. I was wondering if it was particularly hard to see the difference. I really have to test them side-by-side to be able to say. But based on my recollection, at 1x, I think it's close to the Mod3, but not quite as sharp. I really do find the binocular fusion to be more difficult with the -A/C body versus the -B/D body. With H-alpha and inside the scope, I'm not willing to comment because the optical properties of the scope itself were the dominant factor in sharpness. I'm back in town this weekend, if you wanted to perhaps get together Sunday night. Yes, maybe Sunday. Check in when it gets closer. Unfortunately, I've found that the PVS-7A/C nosepiece adapter for C-mount has somewhat recessed threads, so my ENVIS lens doesn't seem to fit, nor do any of my SLR lens C-mount adapters. Try again after removing the straight knurled adapter. This dual cs and c-mount adapter was pretty well thought out but that doesn't mean it intuitive. The knurled adapter that needs to be removed has left hand threads so turn clockwise to remove it. See the following photos for visual reference. On the sharpness, at 1X a higher res tube will show sharper stars. Your new PVS-7A/C unit with the WP tube came from Glynn, right? All of the tubes that he had were rated at 64 lp/mm res. Is your Mod3 tube a 72 lp/mm tube? If so, that could explain much of the sharpness difference. Edited by jdbastro, 27 September 2017 - 12:03 PM. cnoct... you are a life saver. Thank you for the tip. I never would have suspected it was counter-threaded, and Glynn certainly never mentioned it when he sold me the adapter! Thank you so much! @jdbastro - You're right, my Mod3 tubes have always been 72 lp/mm so that explains it. Interesting, my a/c did not come with that knurled adapter. I see the thread where it would have gone, but it came with a tapered rubber cover that I removed because it interfered with the c mount to 2" adapter. Ah, that explains it. I purchased Glynn's last ENVIS with my PVS-7a/c, so it came with that rubber sleeve. I don't believe that I would have a need for that knurled spacer. Thanks for the info! Turns out that something is amiss with Peter's PVS-7 and I suspect some kind of collimator issue. Peter and I met out in a not so dark and very dusty site last night so he could try out his newly acquired dob (Wow was it great!) and when I tried the PVS-7 A, I could immediately see that something was not right at all. First, the diopter on the right side could not reach 1.75 diopter setting while the left side could, but more seriously as I panned, brighter objects in the field put off prismatic blurs and nothing seemed as sharp as my PVS-7 A did. Peter compared them both and quickly accepted my thoughts that his unit has some kind of issue and most likely something wrong with the collimator. His power switch is also not right.. He compared it to mine and realized quickly that the action was loose and notchy while mine is very smooth. Without having something to compare it to, I guess he simply did not realize that it was not where it should be. He is going to send it back for service. It was fun to look though a PVS-7 with WP tube, but I think most of Peter's problems he mentioned above about the view were due to something not being right in his unit. (His dipoters though were far smoother than mine... I need to figure out how to grease them. His are practically butter smooth compared to how stiff mine are). Edited by Eddgie, 01 October 2017 - 08:56 AM. That's because have a fresh coating of $100 an ounce grease (Krytox 240AZ). I personally wouldn't recommend you trying it yourself unless your ready to replace the eyecup rings. It's really easy to snap them during the removal or damage another critical part of the assembly. Like you I prefer doing things myself but seriously outsource the job to someone who you know uses the OEM grease (Krytox 240AZ). Isn't NAIT local to you, I would think Ken could get you squared away in no time. 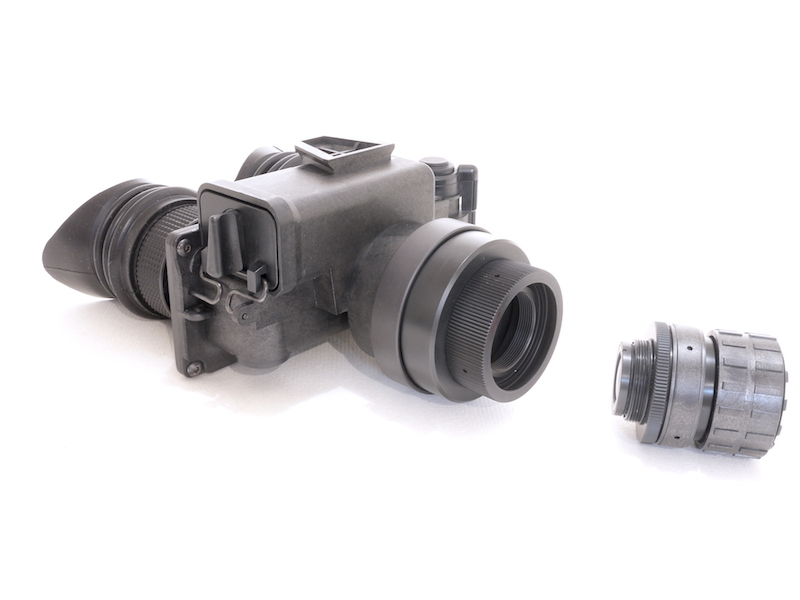 There are two different eyepiece designs and they will interchange. It's quite possible for the left eyepiece to be of a different design and manufacturer That of the right side and of course vis versa. Both eyepiece type will have a total range of travel of .20" however, one style say the fujinons will have a greater travel outward and very little inward in comparison of the other type. I replaced my old ones with the fuji's and never looked back. Even though these are being sent back I thought you might want to know that it's possible there's nothing wrong other than the eyepieces could be potentially mixed. This would look weird as one eyepiece would be nearly flush with the eyecup ring when at +2 while the other one protrudes and 1/8" above its eyecup ring. There's also the potential for chromatic aberrations caused by the optics that were designed for the relatively monochromatic radiance of narrow emission phosphors such as P43. Now throw blue green and red emissions of P45 in the optical mix and you could end up with quite a mess. I can only surmise that the multi chromatic emissions of P45 paired with optics which were never designed to correct for the emission characteristics of P45 may infact be the reason your experiencing chromatic aberrations as apposed any other cause. You so should have switched the tube to your PVS-7A/C and an B/D. It is not terrible,but as compared to Peter's it takes noticeably more effort to turn. Yes, I don't mind doing this kind of thing but I agree if one has never done it and it is something that only needs to be done one very rare occasions, and there is a reasonable risk of breakage, then best to have someone that has experience do it. I had also considered the issue of the monochromatic radiance (though I simply thought "White Phosphor" because well, I do not have particularly sophisticated language skills.. LOL). It was though very "Lopsided" with the bad purple fring in particular appearing always to the left of bright objects (or so it seemed to me). It also seemed a bit worse in one eyepiece than the other too. Peter had indicated that he had some trouble with getting the image right, and I did to. I have been using my A/C for months now, and I can put it to my eye and the view seems perfect (always has) but I just could not get his to feel as natural as mine. Could though very well be chromatic aberration from optics that were designed to work with a monochromatic light source. It will be interesting to hear what the dealer says when Peter gets it to him. At any rate, the view in Peters clearly had some issue and I hope for his sake that it is not going to be something inherent to using the tube in a PVS-7 because well, that is the only thing that tube will work in, yes? I hope it is an alignment problem. Comparing my PVS-7 (green Phosphor) to his though, I could immediately see something was not right. As for me? I just built up a PVS-7 B from parts to sell one of my PVS-7 tubes and when working with the PVS-7 B, it reminded me how much I actually like the PVS-7 B. Also, I have to say that for general use, I prefer the Mil objective over the ENVIS. Envis is just to slow to focus for geeking around in the dark. The B/D is one of those great designs (to me) where form follows function and everything is so purposeful. It handles much different than the A/C, and I actually prefer the handling of the B/D. I am considering building up another B/D body so I can have one of each. When I was testing out the new B/D body before I sold it, I confess to having preferred it to the A/C for ergonimics and usability. I am seeing more and more PVS-7 B/D parts on Ebay with "Make Offer" and I think I will piece another body together for myself. Edited by Eddgie, 02 October 2017 - 12:41 PM. Agreed on the ergonomics of the B/D. In another thread I, to everyones I confessed that if either my 7C or 7D mysteriously disappeared, I'd miss the 7D's. There's no doubt a good 7C is optically superior but those 7B/D's have that Tonka truck touchableness that just feels as it should. I know it might sound geeky, but I used to just take out my PVS-7 B/D just to admire its design.